Hello! I’m on the other side of 25 and feelin’ fine. In the twoish weeks since my birthday, I’ve already accomplished one of my goals – I paid off a loan! Granted, it was one of my smallest private loans, but it’s GONE. Woo! That rush of minimal-exertion accomplishment felt so good that I’ve decided to pay off my Perkins loan next month, I think. I have the money – I’ve been shoring up my savings account for the past couple years, and even though it’s hard to drop a couple thousand dollars at a time, it’s saving me money in the end because, hello, that interest accrues mighty fast! Anyway, I’m excited to already cross one thing off my list. I’m so productive now that I’m old and mature! Ha ha ha. So, what did I do on my 25th? Well… I ate pizza. Yes, for my big birthday dinner, I chose pizza. What can I say? I’m a little tired of the vegan options in Madison (appreciative though I am of their existence! ), and S had raved about the delectable pizzas that are birthed from the wood-fired ovens at Pizza Brutta on Monroe Street, and I’d been craving a simple, thin-crust pizza with garlic and marinara sauce… so pizza it was. And it was good. Ahh, the pizza marinara. 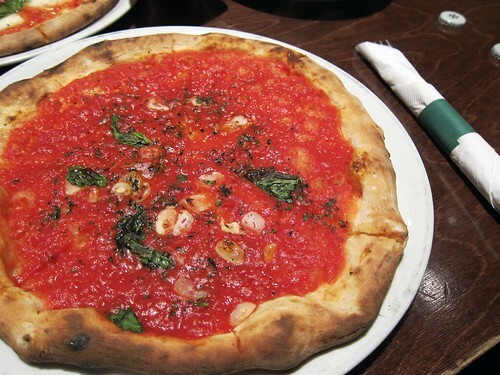 A perfectly baked crust topped with vibrant crushed tomatoes, basil, oregano, and garlic – exactly what I was craving. Perfection! Although the pizza was definitely a highlight of my birthday, I also really loved my gifts and talking with my loved ones. I have the best family and friends. They know me so well – many of my gifts were kitchen-related, from the homemade vanilla extract (made with organic vodka!) from my dear friend Nicole to the gorgeous cast-iron pan from S and the double boiler/steamer from my parents. My parents also framed a truly adorable picture of my mom and baby-me, and it now sits in a place of pride on my windowsill, nestled between my basil plant and a photo of me with my best ladyfriends from college. I could go on, but nobody likes to read a litany of someone else’s gifts. :) Suffice it to say that my 25th birthday, though low-key, was wonderful – a great way to usher in this year of Actually Accomplishing Things and Figuring Stuff Out. Would you prefer an all-out birthday bash or something quieter? And what should I make to showcase the flavor of my new vanilla extract?! That pizza looks amazing! And congrats on paying off a loan. It’s a huge deal, and totally worth the short-term hit to the bank account. :) Thanks! I feel prouder than I should for simply hitting a few buttons on the internet and transferring money around. Happy 25th! I think I prefer a quieter celebration — always have. I used to live a short walk from Pizza Brutta! Thank you! And that’s neat – I really like that area.